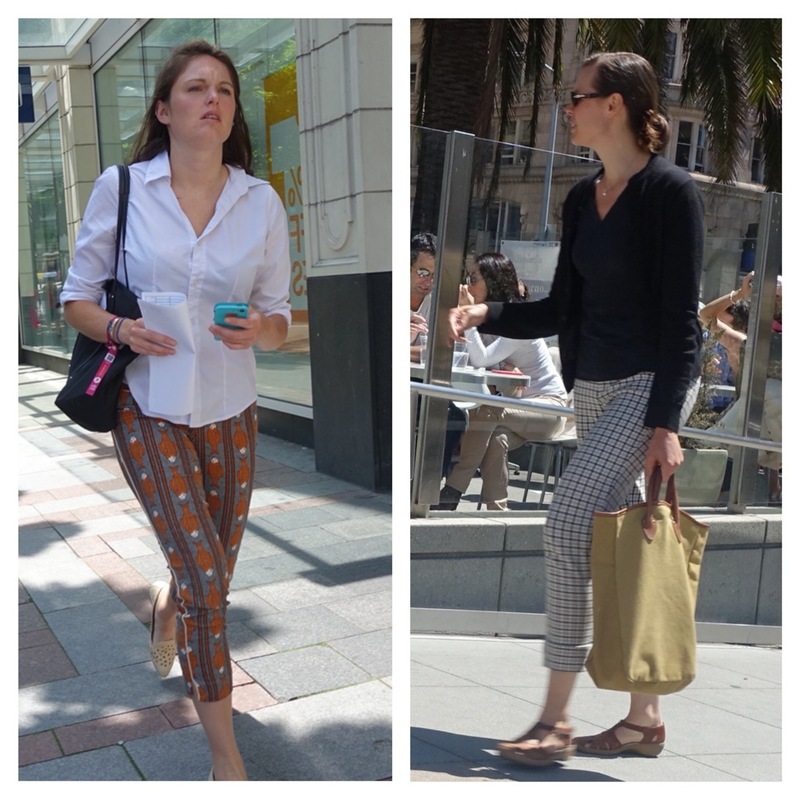 Have you noticed an explosion of printed trousers on the streets? Yes, they are everywhere, and it stands to reason. They are a way to infuse fun and hip-ness into one’s work wardrobe – and they can also be awesome for play. It would be quite effortless to raise the register of these ensembles: simply exchange the flats/sandals for kitten, medium- or high-heeled pumps. For the office or courtroom, a great recipe for success is a more tailored, fitted trouser with billowy blouse, button-up blouse, or tee with cardigan. 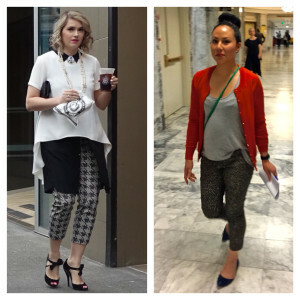 I especially love black and white printed pants with a brightly colored top or sweater. 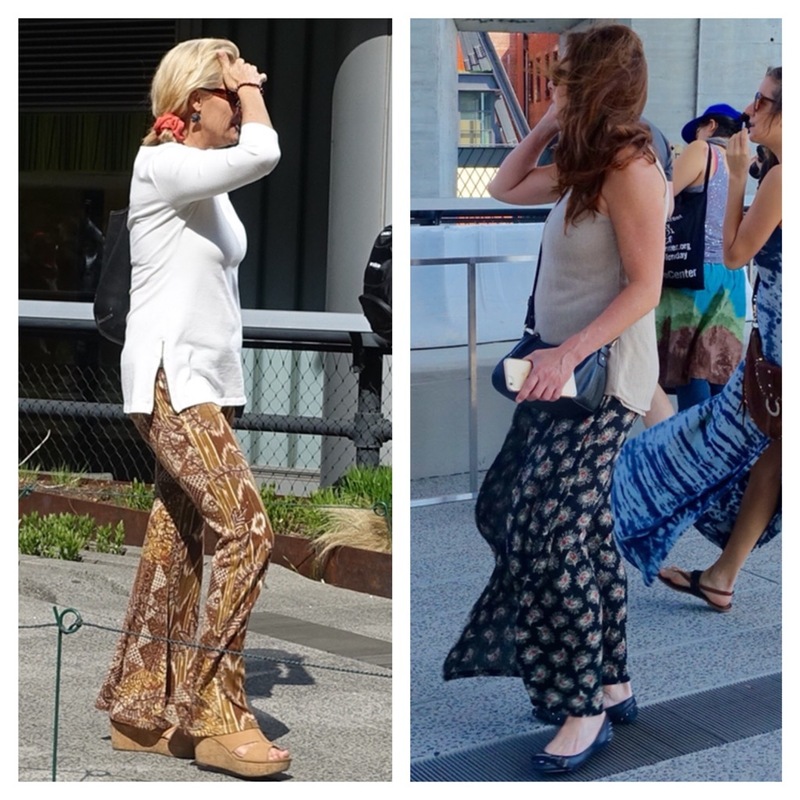 unless, of course, you are going for an ultra casual boho look. In theory, I love the idea of elastic cuff pants, harem pants and other baggy trousers with a wild print on them. They have the potential to give off an androgynous, slouchy-cool, maybe even theatrical vibe. But they can also potentially resemble pajamas. Even with somewhat baggy trousers, I think the muse to the right looks adorable. Sometimes a little structure can go a long way, if you know what I mean. I believe most of us are drawn to some kind of balance; so, if the pant is more relaxed, the top, sweater or jacket should probably be of a slimmer fit. The muses below pull this off beautifully: don’t they look incredibly hip? 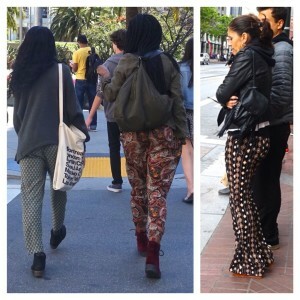 A lot of these printed trousers look fantastic. 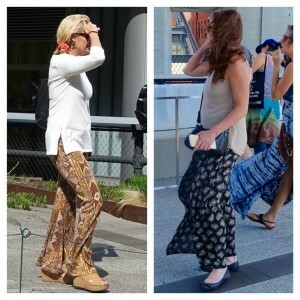 I am holding off wearing them myself until I find a small pattern print – large often accentuates curviness – and a cut which downplays the tendency of these trousers to visually widen one’s lower half. For those slender-legged lassies though, the world is your oyster: a decent silhouette is certainly not beyond your grasp. And as you can see, there is a lot of fun to be had here! What do you think of patterned trousers?